Over the weekend, we had the honor of hosting a baby shower for some dear friends of ours, Mike and Janelle. We chose to make the shower coed since I know Mike through work and the people we were inviting were colleagues and friends of ours. 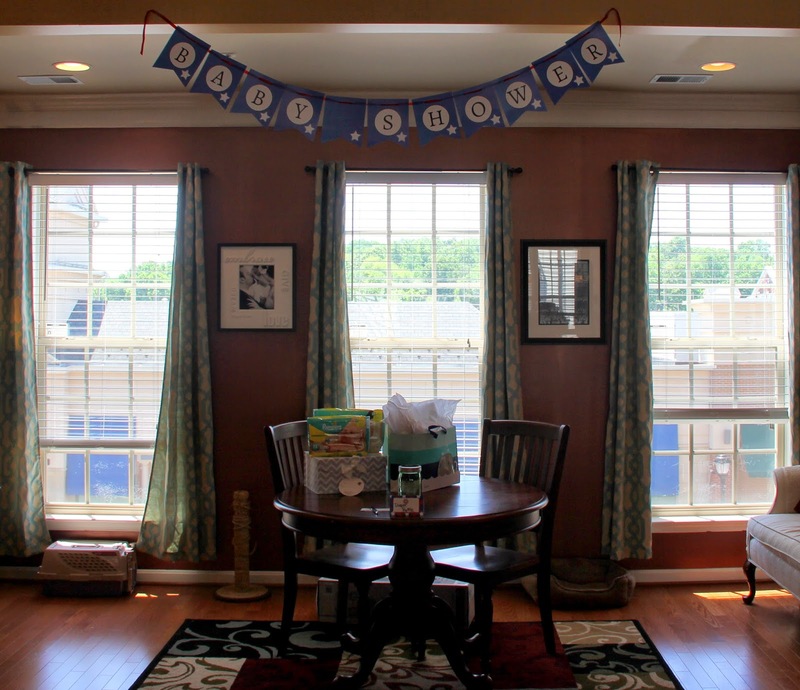 Silly shower games and over the top baby decorations were not the focal point of this party. However, gathering together as friends and celebrating the soon to be parents was. 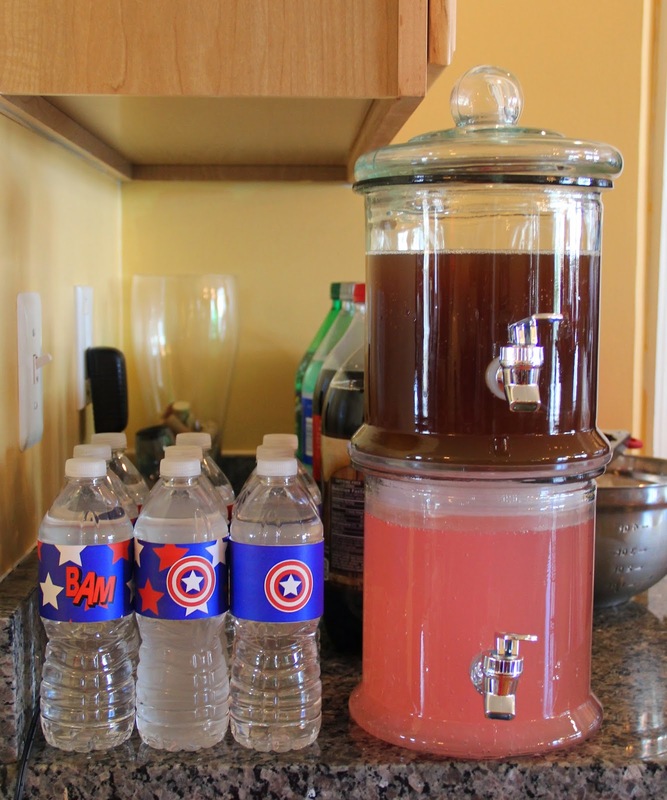 This was my first time hosting a baby shower, so the pressure was on! As I mentioned before, I wanted it to be special but not the typical female centric shower we are all used to, so it didn't take long for me to come up with a plan. Mike LOVES Captain America and Spiderman, and with a baby boy on the way, it only seemed fitting that the theme be super heroes! 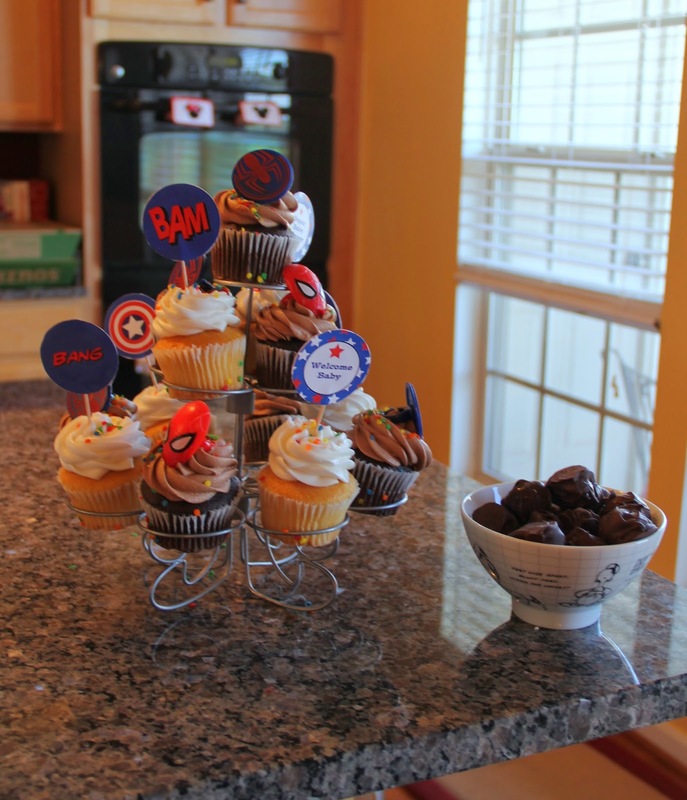 I found some great Captain America printables on Etsy and used them for the decorations. The package I bought came with tons of stuff, but to keep it toned down (didn't want the men to run away scared), I stuck with the basics: Banner, cupcake toppers and water bottle wrappers. Thanks to a few other colleagues, we had a GREAT spread! 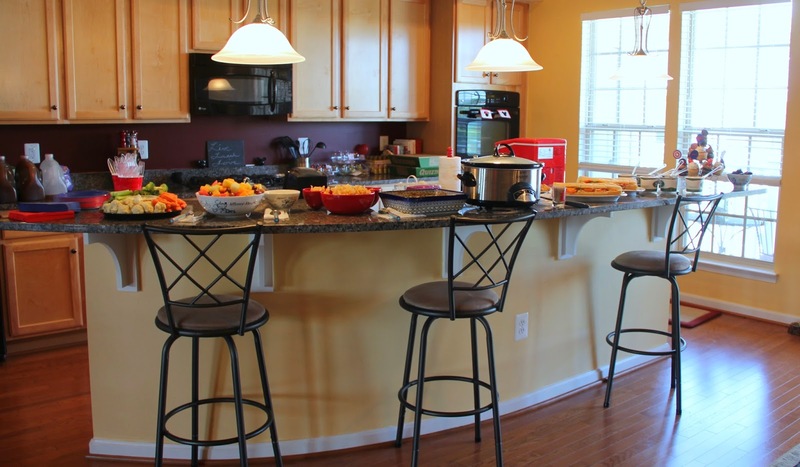 Fruits, veggies, chips and spinach dip, meatballs, sausage balls, sandwiches, cupcakes and oreo balls was the menu. No particular theme, just enough to cover all our bases and to keep people fat and happy. Part of the Mike and Janelle's gift was this bowtie onsie. 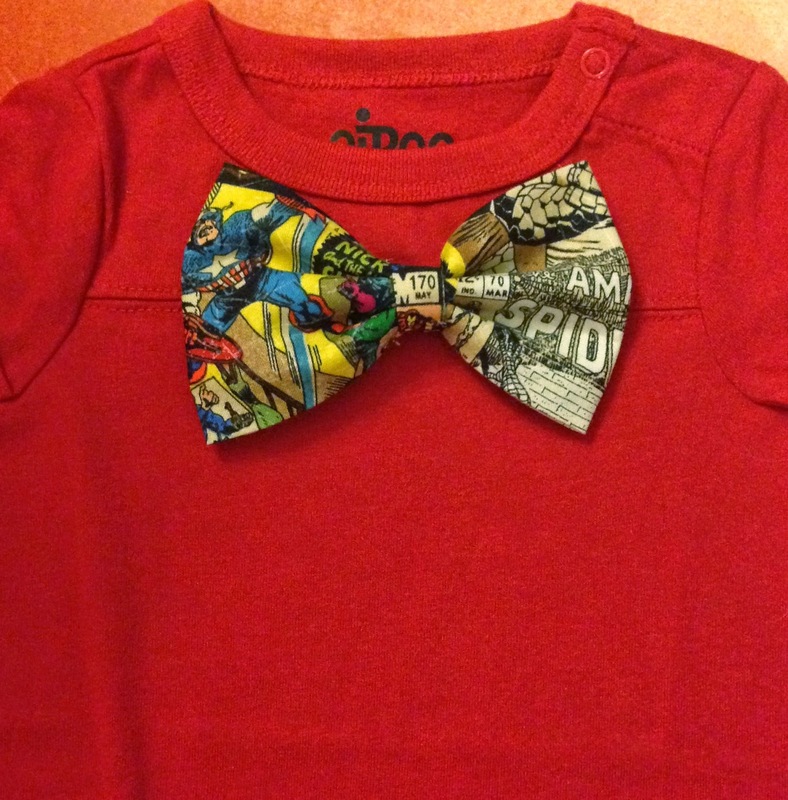 I made the bow tie using comic book fabric and sewed snaps on the onsie to attach the tie to the shirt. Simple, yet cute. 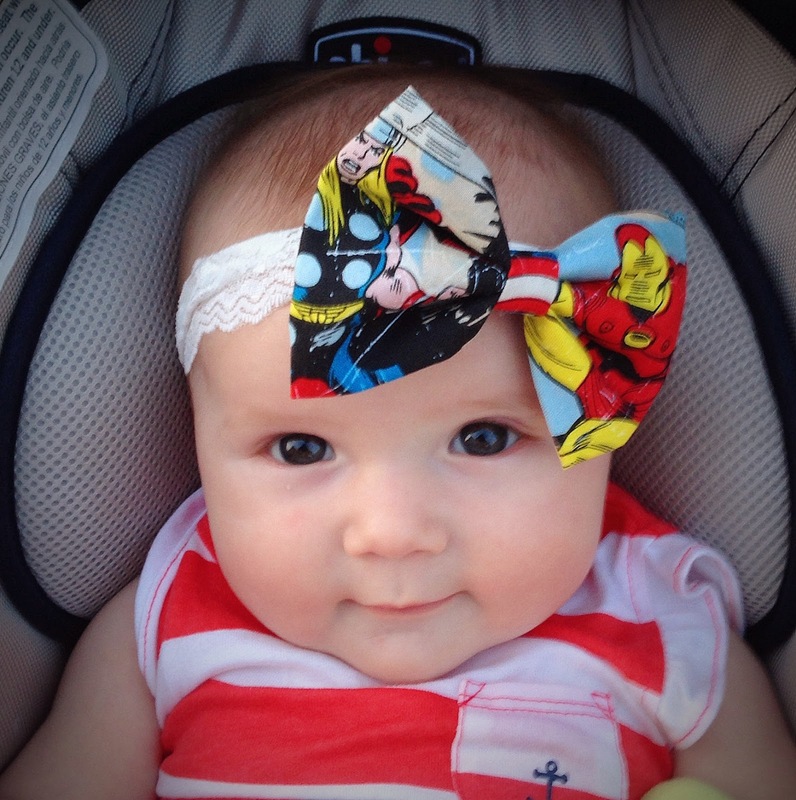 Charlotte didn't want to feel left out, so she rocked her Avengers bow to be festive. The best part about this shower wasn't the food, fun or gifts, but the fact that Janelle went into labor that night! She still had two weeks before her due date, but their precious baby boy didn't want to wait. I guess the party got him all excited and he couldn't wait to make his grand entrance any longer! We are so happy for them and can't wait to meet little Kellan! Wow!! What a lovely baby shower. I loved your arranging ideas and baby looks so cute in bow. Last week went to friend’s baby shower at one of venues in Los Angeles. It was really good to be there and enjoy the day.